Celebrating City Weekly's Burger Week[s] with some local bun-tastic flavors. May 28 is National Burger Day, and here at City Weekly, we're celebrating the great American hamburger with our own Burger Weeks, Wednesday, May 18, through Tuesday, May 31. Now, I am quite aware that burger passion runs as high, and can be as controversial, as passion for pizza and politics. Name your favorite pizza joint, burger spot or politician and you're bound to piss some people off. But, that's what they pay me for. Here then, are a few of my favorite burger places. Most are newish and/or spots that might fly a little under the radar. I've purposely omitted many of the joints whose praises I've sung in the past, so as not to turn this into a "Best of" article. They know who they are. Followers of Chef Nick Watts' Chedda Truck, which he took to the streets of Salt Lake City in 2012, will be thrilled to know that he now has a permanent brick-and-mortar location: Chedda Burger (26 E. 600 South, 801-906-8779, CheddaWasted.com). Watts' fresh-ground, 100 percent natural Angus beef burgers are mostly intended for the adventurous, with options like the Silly Round Eye (beef, pastrami, Swiss cheese, kimchi and fry sauce) or his Kill Me Softly (a beef patty with blue cheese, bacon, arugula and cranberry sauce served on a Krispy Kreme doughnut). I'll stick with the Old Faithful ($6.79): a just-greasy-enough beef patty with classic cheddar cheese, caramelized onions, ripe tomato slices, green leaf lettuce and fry sauce. Skip the limp, skin-on French fries, however. I'm not sure which I love more: the excellent Margherita pizza at From Scratch (62 E. Gallivan Ave., 801-961-9000, FromScratchSLC.com) or their outstanding Scratch Burger ($15). It's a toss-up. The beef burger is thick and juicy—ground in-house, of course—topped with smoked cheddar from Gold Creek Farms, iceberg lettuce, housemade mayo and ketchup and crispy shoestring onions, all housed in a house-baked brioche bun with a side of stupendous fries. I doubt there's a City Weekly reader who hasn't heard of (or tried) the Lucky 13 Challenge at Lucky 13 (135 W. 1300 South, 801-487-4418, Lucky13SLC.com). That's where contestants can win lunch on Lucky 13 and $200 cash if they can finish the 28-ounce, foot-tall Big Benny burger ($17) in one hour. Frankly, I have enough weight issues without trying to eat a nearly 2-pound hamburger. So, I turn to Lucky 13's Ring of Fire ($10). This is the basic burger (which is very good in and of itself), adorned with house-smoked bacon, roasted jalapeños, habaneros, cheddar cheese and grilled onions. I think I deserve a prize for withstanding all that heat! A spin-off of Avenues Proper, Proper Burger (865 Main, 801-906-8604, ProperBurgerSLC.com) is located next door to Proper Brewing, meaning that burgers and brews are in abundance here. The basic Plain Jane burger ($4.49)—which is the starting point of all the burgers except the excellent housemade veggie burger—has terrific flavor and texture. I believe there is brisket incorporated into the quarter-pound beef burger blend. 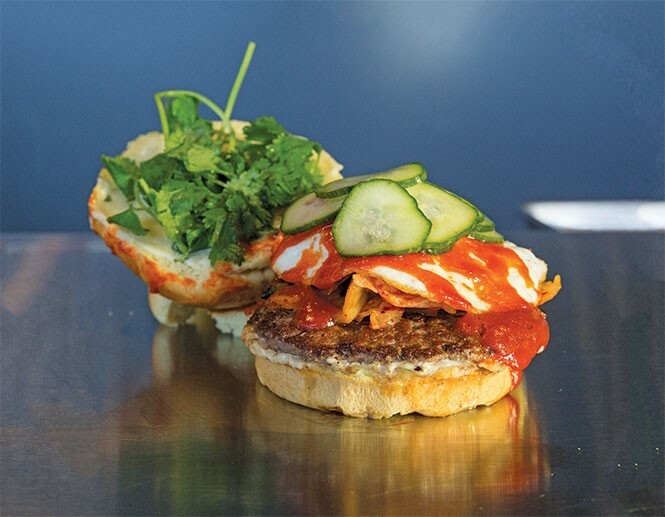 But variations are plentiful, including the $8.49 Rising Sun (with kimchi, miso aioli, cilantro, a fried egg, sriracha and pickled cucumber) and the $7.99 Hipster (featuring kale pesto, red onion jam, fresh herb cheese spread, garlic aioli and spinach). The only Proper burger I can't properly propose—and which I tasted solely for research purposes—is the $26 Truffle Shuffle, made with two patties topped with a fried egg, American sturgeon caviar and truffle aioli. The truffle aioli is overwhelming, and the caviar—which I thought would make the burger super salty—turned out to be nearly unnoticeable. The fries at Proper Burger, however, are top-notch. Don't miss 'em. Burgers & Bourbon at The Montage Deer Valley (9100 Marsac Ave., Park City, 435-604-1300, MontageHotels.com/DeerValley) has their own budget-busting burger. It's called the Lux ($32) and it features foie gras, truffled cheese, bourbon-caramelized onions and arugula. However, a better way to experience the superb flavors of a burger here is to order the Classic ($14), which is a juicy, flavor-packed blend of brisket, hangar and top round beef, topped with Gold Creek Farms aged cheddar. It comes on a soft, buttery, potato bun that's custom-made. Enjoy it with a Montage Mountain Ale, made by Wasatch Brewery. At Tonyburgers (633 E. 400 South, 801-419-0531, Tonyburgers.com), options abound. Burgers come either as a quarter-pound Small Tony ($4.75) or third-pound Big Tony ($5.75), along with optional American, Swiss or cheddar cheese and free toppings: lettuce, tomato, pickles, onions, jalapeños, mayo, ketchup, mustard, grilled onions, southern kick ranch, hickory barbecue sauce or Tony sauce (fry sauce). The delicious beef patties are ground and hand-formed each morning, never frozen. Marvelous milkshakes and fantastic fries make Tonyburgers hard to top. Perhaps my favorite burger of all, though, is to be found in a place not known for burgers, but steaks: Fleming's Prime Steakhouse & Wine Bar (20 S. 400 West, 801-355-3704, FlemingsSteakhouse.com). I somewhat hesitate to let the secret out, but not only is the burger here magnificent, it's also cheap. Head over to the snazzy bar area—with a wine selection that features 100 wines by the glass—and order up the Prime Burger ($8). You won't regret it. Its name comes from its 100 percent prime beef (remember, you're in a steakhouse). That makes for one helluva juicy, tender, tasty burger. It's topped with your choice of cheese (blue, Swiss or cheddar), plus peppered bacon on a challah bun, with lettuce, tomato and red onion on the side. French fries are included, too, all for a mere $8. Try to beat that burger bargain. Do you have a bodacious burger you'd like to represent? Let us know about it.